Bust-length depiction of a young woman, with her head turned three-quarter to the right. She holds a strand of hair with one hand which she cuts with a tiny pair of silver scissors, a distant and melancholy expression on her face. She wears a dress of striped blue and russet coloured fabric with lace around the collar and at the cuffs, and a buttoned bodice. The background is dark and without detail. The frame is in a Pre-Raphaelite style, made of oak and softwood; probably original to the painting with oak reed moulding along the top edge and gilding. 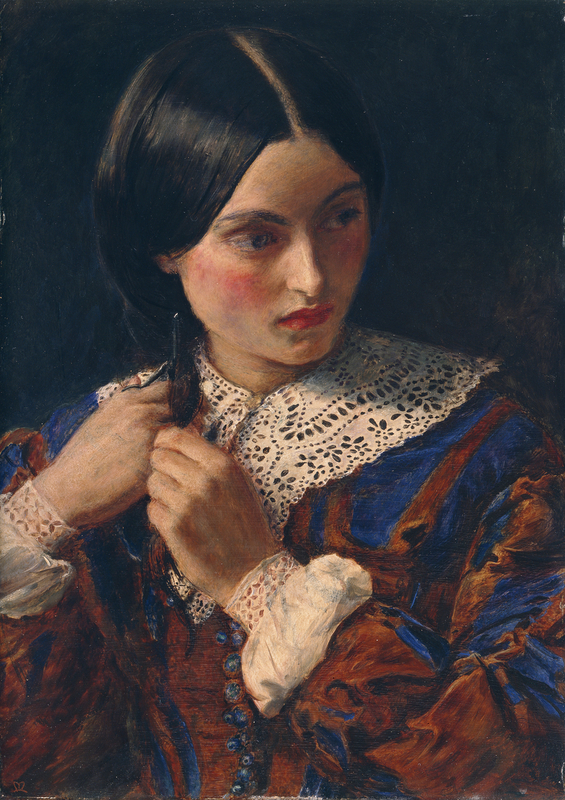 Only a lock of hair about 1857-8 Sir John Everett Millais 1829-1896 Oil on panel The young lady has cut off a lock of her hair. The faraway thoughtfulness of her face suggests all sorts of possibilities lying behind this painted moment. Hair became significant in Victorian world; a lock like this was used as a memento of love, birth or death. The severe formal hairstyles of the Victorian women were rejected by the Pre-Raphaelites who saw free-flowing hair and loose dresses as releases from the stifling rules of convention. Millais' enigmatic works such as this, blending portrait and narrative, were very popular.